The two main shoulder arms of the American Civil War, for both the North and the South, were the U.S. Springfield Rifle-Musket of 1861 and the British Enfield Pattern 1852 Rifle-Musket. Both were nearly the same bore diameter, the Enfield being .577 caliber, and the Springfield being .58 caliber. Both accepted the Minié ball, developed by a Frenchman Claude Étienne Minié. The Minié ball was not really a ball shape; rather it was conical shaped with a hollow base. Prior to its development and general adoption, military muskets were smoothbore (no rifling) because they were much faster to reload than rifled arms, which required a lubricated cloth patch to surround the ball and engage the rifling, more reloading steps, and more effort to get the ball seated against the charge. The Minié ball in a rifled musket was as easy to load as an unpatched ball in a smoothbore musket, but rifled muskets loaded with Minié balls were considerably more accurate. 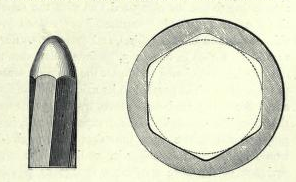 The Minié ball was sub caliber like the ball in a smoothbore musket, but when the charge detonated behind it, its hollow base skirt expanded to engage the rifling so the projectile would have a stabilizing spin. 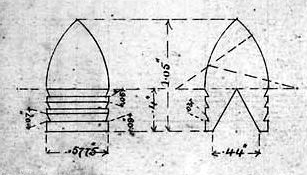 The combination of adding rifling to the muskets and the Minié projectile greatly increased the accuracy of infantry small arms. And since the Civil War was fought using tactics designed for the less accurate smoothbore muskets but used “modern” more accurate weapons instead, the casualty rate went up dramatically. Sniping was not new to the Civil War, having been used in previous conflicts, usually using a very heavy barreled target rifle and open sights or slow-loading “Kentucky rifles.” Along came a British gentleman by the name of Sir Joseph Whitworth, who experimented with rifled artillery that used hexagon-shaped bores instead of rifled round bores. The hexagon-shaped bores were twisted like the rifling in traditional rifled arms, affecting the projectile like rifling does, giving it a stabilizing spin. He extended his ideas to small arms and developed the “Whitworth Rifle.” Not only was the bore hexagon-shaped, but the bullets were an elongated hexagon shape, matching the size and twist of the Whitworth Rifle barrels. Whitworth discovered the longer projectile needed a faster twist rate than the Minié to stabilize it. The result was a major leap forward in small arms accuracy. 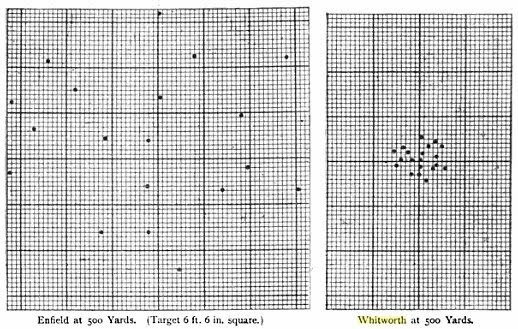 Tested against the Enfield Pattern of 1852 Rifle-Musket, the Whitworth could hold 9-inch groups at 500 yards (less than 2 minutes of angle), while the Enfield, which was considered very accurate in its day, could only hold 54-inch groups! For comparison, modern military small arms, like the M-16, can only hold about 2 minutes of angle (2 inches at 100 yards) unless accurized. The Whitworth could reliably hit targets out to 1,000 yards and beyond. Even though demonstrably superior in accuracy to the Enfield, the British rejected the design, because the Whitworth was four times more expensive than the Enfield to manufacture. That was not the death of the Whitworth. Both Confederate and Union sharpshooters employed it as a sniper weapon, usually targeting artillery crews and officers at previously unheard of ranges. Most of these Whitworth Rifles used open, iron sights like those on the Springfield and Enfield, but some were equipped with 3-power telescopic sights mounted to the left side of the breech. These Whitworth Rifles were exceptionally deadly! According to popular accounts, on May 9, 1864, during the Battle of Spotsylvania Courthouse, Union General John Sedgwick discovered just how accurate the Whitworth could be. Shots from Confederate Whitworth rifles, easily identified by the shrill whistling noises their hexagon-shaped bullets made in flight, caused members of his staff and artillerymen to duck for cover. Sedgwick chastised them and proclaimed, “I’m ashamed of you, dodging that way. They couldn’t hit an elephant at this distance.” Seconds later he pitched forward with a bullet hole below his left eye. On Sept 19, 1863, at the Battle of Chickamauga, Union General William Lytle was leading a charge and became the target for a Confederate with a Whitworth. He was mortally wounded. On the second day of the Battle of Gettysburg, disregarding warnings about the Federal sharpshooters armed with Whitworth rifles with telescopic sights mounted on them, Confederate General Richard Ewell and his engineer ventured to within 1,000 yards of the Union lines on Cemetery Hill. Ewell took a Whitworth round in his wooden leg, and the engineer was shot through the body and killed. In An Eternity of Four Years, I have a scene where Ethan has an encounter with these same sharpshooters who shot at Ewell. That excerpt will be the next post. Battlefield “technology” made huge advances just before and during the Civil War, and the resulting casualties were staggering compared to previous conflicts.